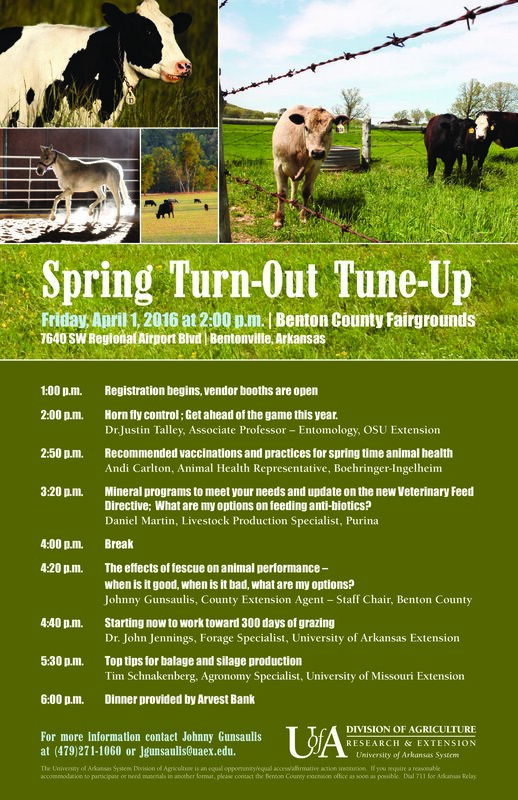 Get Ready for Spring Livestock Production at the Spring Turn Out Tune Up! With days getting longer and temperatures warming up, it’s time to start shifting farm focus to herd health and forage production. 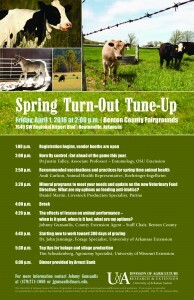 To help prepare you for the growing season, the University of Arkansas System Division of Agriculture Cooperative Extension Service in Benton County is offering a “Spring Turn-Out Tune-Up” workshop on April 1st. The program will be held at the Benton County Fairgrounds (7640 SW Regional Airport Blvd) with registration and time to visit vendor booths beginning at 1:00 p.m. and presentations starting at 2:00 p.m. Throughout the early afternoon, sessions will focus on animal health and feeding. Topics range from horn fly control, vaccinations and timely animal health practices to mineral programs, updates on the new Veterinary Feed Directive and antibiotic feeding options. The late-afternoon portion centers around pasture management with presentations on fescue impacts on animal performance, planning for 300 days of grazing and tips for balage and silage production. The program will conclude with dinner provided by Arvest Bank at 6:00 p.m. There is no cost to participate in this program, and all are welcome to attend. For more information, contact Johnny Gunsaulis, County Extension Agent – Staff Chair by phone at 479-271-1060 or through e-mail at jgunsaulis@uaex.edu. This entry was posted on Thursday, March 3rd, 2016 at 9:26 pm	and is filed under Events, News & Updates. You can follow any responses to this entry through the RSS 2.0 feed. Both comments and pings are currently closed.